John Turnbull Thomson was a young surveyor when he first arrived in the Malay Peninsula in 1838. Only 17 years of age, he started work in Penang and arrived in time to witness first-hand the events surrounding Kedah's last war of independence from Siam. 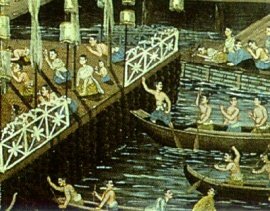 He took an interest in the Malays and soon learned to speak Malay fluently, quickly gaining a reputation as having closer contact with the Malays than any of his fellow countrymen. He frequently wrote of the grievances of the Malays and his description of the Kedah war below highlighted not only the miseries suffered by ordinary Malays at the hands of the Siamese army but also the unease of many Englishmen at Britain's support for Siam in the conflict. Kedah was a weak Eastern state, situated at the fag end of two powerful ones, viz., the Siamese and Burmese. It was expected to serve both these masters ; consequently it hated one and despised the other, and got into bad odour with both. When Burmah was stronger than. Siam, it acknowlegded its superiority; when Siam was stronger, it paid obeisance in that direction. The exactions, whether of men, money, tokens or symbols, that Kedah had to bear, were at the caprice of the monarchs of these countries. Kedah would have gladly propitiated either for the sake of peace ; but this was not to be. Siam claimed a token - the Bunga Mas (golden flower) -while Burmah claimed assistance in men. What was to be done? The English were powerful; -might not Kedah rest quiet under her wings ? Such might have been the thought when Kedah offered Penang to Captain Light. Captain Light, on behalf of' the East India Company, bought the island for a consideration; but he did not engage to protect Kedah from its political enemies - the real of object of the Malay Rajah. 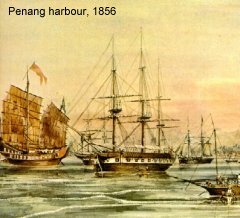 Captain Light took possession of the purchased island of Penang, on the l7th July, 1786. If it belonged to Siam, Siam should have protested against the transfer. This Siam did not do. Sir George Leith again, on behalf of the East India Company, bought Province Wellesley from Kedah for the sum of two thousand Spanish dollars. This happened on the 15th July, 18OO, nor was this transfer opposed by action or protest on the part of Siam. If Kedah had been a province of Siam, and the Rajah of' Kedah a mere vassal, these cessions of territory at distinct dates must have either been silently approved of by Slam, if not, those were the times to protest. Kedah sent admissions of superiority to Siam, but so does Siam to China. Reasoning on the basis of these admissions, how is it that, in after years, Siam claimed more to do with Penang than did China? Kedah had her native line of princes, son succeeding father for generations, as Siam has nephew succeeding uncle. Kedah had her written laws as Siam has. What difference was there between these two kingdoms ? -Merely this, Siam was strong, Kedah weak. The claims of Siam were the claims of might, not of right. Siam was jealous that Kedah had obtained an European friend and neighbour, so she determined to vex her. First she coerced Kedah to make war on Perak : this was in 1813. The object was to weaken both, preparatory to their being overrun. In 1821 Siam overran Kedah, and its native princes fled. She would have done the same to Perak, but for the fear of the English and the Dutch. 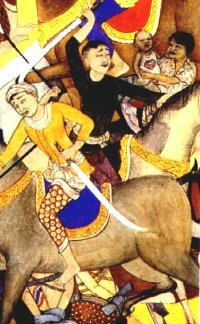 Kedah was devastated, and many of her inhabitants carried off to slavery. Thousands fled into Penang and Province Wellesley. This suited the purposes of the English land proprietors ; it cleared their jungles, and gave them a settled population. In 1822 the Burmese war was looming in the distance; so it was found to be English policy to propitiate Siam. Kedah relations were consequently sacrificed, and the grant of Penang and Province Wellesley was sought to be confirmed by Siam. This object was attained in 1826, under Colonel Burney's treaty with Siam. In 1831 Tuanku Kudin, a chief of Malay royal blood, headed an insurrection against his Siarnese conquerors. He was successful at first, and regained temporary possession of his native country. But England's assistance was now given to Siam, and he was reduced. 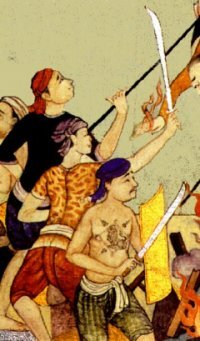 He remained by a remnant of his adherents, fifty or sixty in number, and died a hero's death in defending Kedah fort. He was overpowered by numbers, and nearly all died with him. As in the case of Sir William Wallace, the patriot's head was sent to the (Siamese) capital. Kedah was again devastated, and Province Wellesley replenished with settlers; lands rose in value, and rents ruled high. It was at this time that the East India Company's chief official took up extensive land claims. But the value of his land acquisitions met another check ; for, in 1838, a man called Tuanku Mohamed Saad, a prince of royal blood, raised another insurrection against the Siamese, and carried many people away with him from Penang and Province Wellesley. Rents fell, and the value of land in the English settlements again became nominal. Tuanku Mahomed Saad drove the Siamese out of Kedah beyond Sangora; but the English and the Siamese were now allies. He was consequently beaten back, escaping only to be laid hold of by the East India Company 's Government as a pirate, and to be dealt with as such. Kedah this time was utterly destroyed; its fertile plains wasted ; the herds were driven off the fields, and the fruit groves were cut down ; the mother fled with the infant at her breast, and the father crept through the jungle with his little ones in his arms. Province Wellesley was again replenished with settlers, and Englishmen speculated and grew rich on the troubles of their neighbours. More eyes than mine have witnessed these scenes, so I dare not exaggerate. In 1786 the English settled down on a desert island near flourishing Kedah. In I838 Kedah is itself a desert, the island Penang a very garden full of life and prosperity. I have seen the poor Kedahan come to the sheds and outhouses to lie down and die. Others more fortunate in preserving life, were glad to labour for their bare rice only. The actual strife of warfare is not the worst. Oamut used frequently to exclaim, "Kalau raja berkelahi, orang kecil binasa" ("When princes fall out, the destruction comes on the lowly"). An appropriate illustration for the tirnes. And shall we ascribe all these miseries to the English ? Certainly not. They must lie in the first place at the door of the Raja of Kedah, who sold Penang for a good price. He did not fully explain his connection with Siam ; and, by this want of frankness, brought his country into great danger. Had he not counted on the assistance of the English (which he had no right to expect) hr would have been more complacent to Slam, and averted her vengeance. Kedah would have done as she did heretofore, and submitted to exactions for the sake of peace. But the after part that England played in assisting Siam against Kedah, was abhorrent to generosity, not to speak of gratitude. Such a course would never have been sanctioned by the home authorities, however expedient or proper it might have appeared to the East India Company's Government in India, if they had been fully aware of the facts of the case.